If you loved the Facebook pillow we posted a few days ago, you’re gonna like this one. Continuing the trend of Facebook invading our physical environment, it’s an $11.99 mouse pad based on the familiar “What’s on your mind” box from your Facebook home and profile pages. We don’t recommend writing anything in this box though. Buy the Facebook mousepad from the Meninos studio (there’s also a Twitter version, and a discount if you buy both). 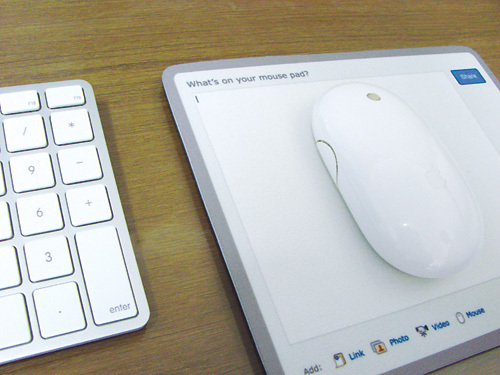 Mind you, we have our own Facebook-inspired mousepads selling for a dollar less. Here’s what we got so far, but more designs will be added soon. Posted by Pieter on August 25, 2009 at 6:18 AM. Use this trackback if you're linking this story.